Chet Baker - mellifluous crooner and first-rate jazz trumpeter - grew up in the shadow of Miles Davis and his West Coast distance from the cool jazz scene of New York. In this new fake-fiction biopic, Ethan Hawke plays him as endlessly charming but vulnerable, most of all to Davis' harsh note that he needed to go away and experience life to be truly great. And per Robert Budreau's inventive but ultimately psychologically reductive script, Baker decided not just to emulate Davis' playing but what he perceived to be the secret to that greatness - being high. And so our hero becomes a junkie, to the point where drug-dealers break his jaw and destroy his ability to play. That's the tragic irony of his life - a drug fiend so addled that he destroys the very physical ability to play because he thinks the drugs make him play better. This is the dramatic set-piece finale of the film. Baker finally cleans himself up and teaches himself how to play again, and his promoter finally let's him play one night at the hottest jazz venue in town, in front of all-time greats such as Miles Davis and Dizzy Gillespie. But Baker gets nervous, injects heroine and falls right of the wagon. And that's where he stayed up until his death. The price of the addiction, according to this movie, is the loss of love - depicted here by Carmen Ejogo as the composite lover who walks out on him. There's a lot to love in this imaginative and free-wheeling depiction of Baker's life. Budreau's fictionalized interpretation hits the relevant emotional markers without getting too hung up on the actual historical record. To that end, it's a little like jazz improvisation. In addition Budreau actually takes us behind the camera lens to the see the actors discuss Chet's motives, which feels fun and daring but actually makes the reductive psychology even worse. That said, I really loved the twin performances on which this movie rests. They just feel right. Hawke may not sound or look that much like Chet - way to well-built and could anyone really imitate that unique singing voice? - but something about his eager-to-please, wounded look just feels right. 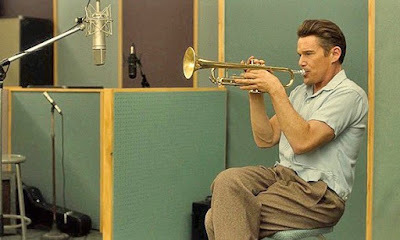 Ultimately, I guess, the best Chet Baker film remains Bruce Weber's 1988 documentary LET'S GET LOST, (my review can be found here). But this is a worthy fictionalized counter-piece. BORN TO BE BLUE has a running time of 97 minutes and is rated R. The movie played Toronto 2015 and SXSW 2016 and opened earlier this year in the US and Canada. It is available in the UK on streaming services and will open in Japan on November 26th.